Earlier in January, I taught at Quilting at the Lake, Lake Havasu, AZ, a wonderful annual quilting event organized by the Havasu Stitchers. I can highly recommend this well organized and fun retreat. 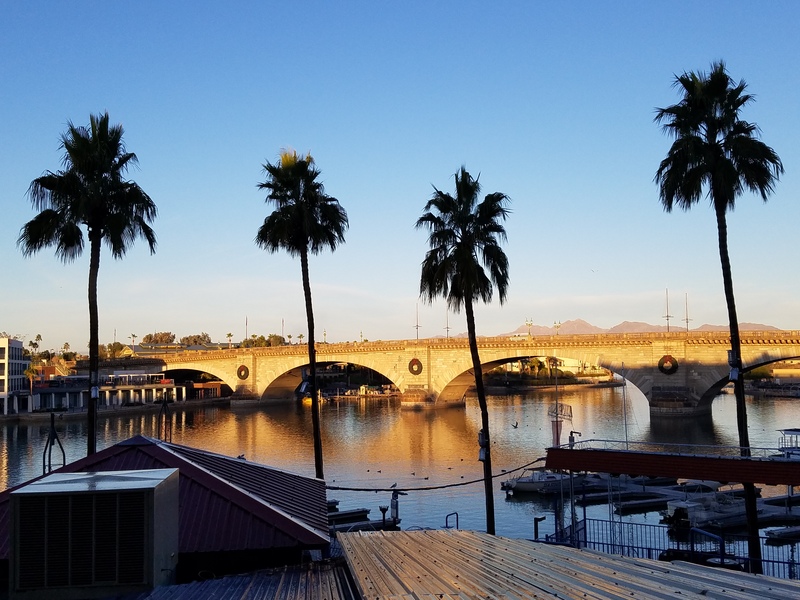 This was my first time to teach in AZ and I was delighted at the opportunity to take a winter break and head for some sunshine by the lake! The event was held at the London Bridge Resort and I was excited to have a beautiful view of the bridge from my classroom! As a child, living in the UK, I can recall hearing about some place in Arizona which had purchased the London Bridge and was transporting it stone by stone to the desert and creating a channel over which the bridge could span. This was a big joke to us especially as it seemed to us that they had anticipated getting the Tower Bridge! However, the locals don’t remember this disappointment and are very proud of their bridge which is a major tourist attraction and can take the credit for the prosperous growth of the town. I have to say, that the bridge is definitely a highlight of the city and looks very handsome, fitting in surprisingly well with the beautiful lake and spectacular surrounding mountains. My class was full and I taught an overflow group two days later. 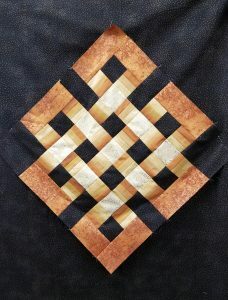 We worked on the Gateway to Mongolia pattern making the large central Olzii block. This motif is painted on the doors of yurts in Mongolia to bring long-life and prosperity to the people who live there and to drive away wild beasts and evil spirits. It also has special significance in the Buddhist faith which is practiced in Mongolia, symbolizing the universe and never-ending cycles of life and death. The woven effect is achieved by using a color gradation of fabrics. 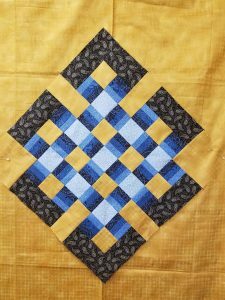 Having a smooth gradation of fabrics is key to the success of the under-over illusion. The pictures show some of my students’ work. 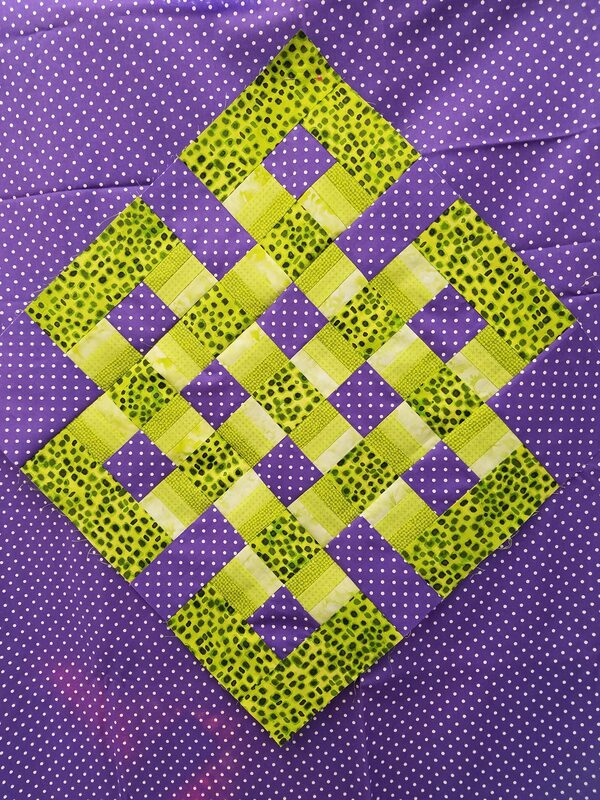 The purple and green one was an unusual choice of fabrics but it worked! I always enjoy seeing the different results from the variety of fabrics brought to class. 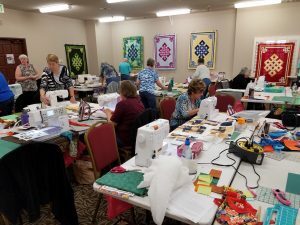 I’ve just returned from a wonderful trip to AZ, where I taught at the Havasu Stitchers annual Quilting at the Lake event held at the London Bridge Resort in Lake Havasu. The guild has a membership of over 200 and about a third of them are snow birds. They are an active, busy group who gave us teachers a wonderful welcome. In the lobby of the resort there is a replica of the golden carriage used in Great Britain to take British royalty to their coronations. 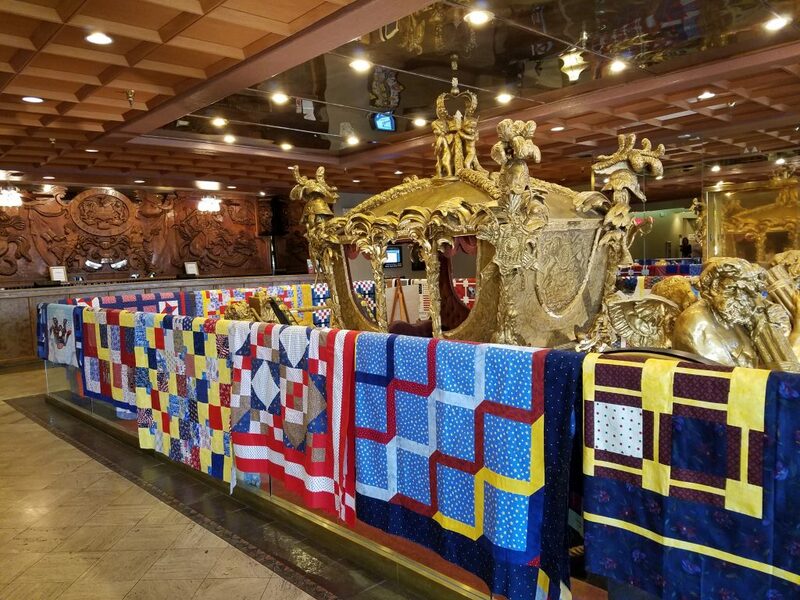 The railing surrounding the carriage was a perfect place to display quilt tops made for American veterans! 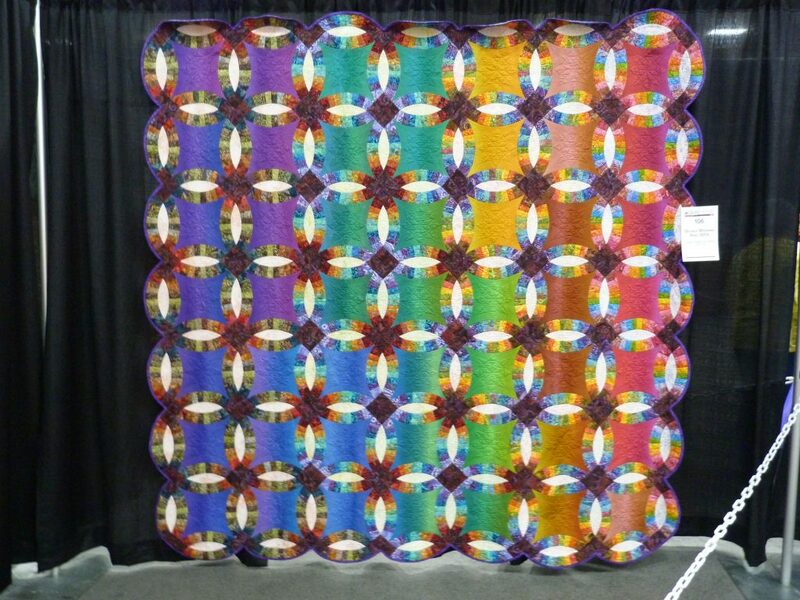 These Double Wedding Ring quilts were exhibited in the judged AQS show at Des Moines. 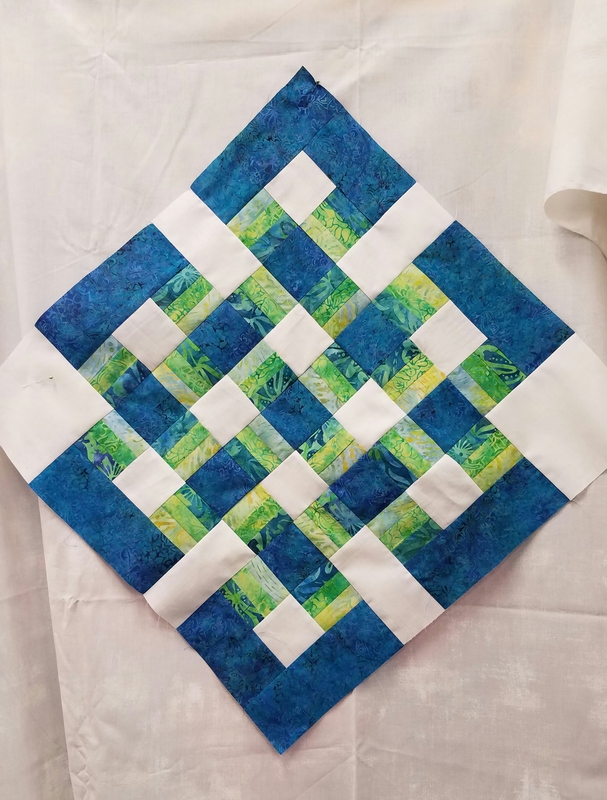 I was drawn to the unusual use of color in these two quilts and to how the changing background colors and the placement of different values refresh this traditional pattern. Double Wedding Ring 2016, 88″ x 88″, made by Susan Haslett-Schoflield of Canton, MI. 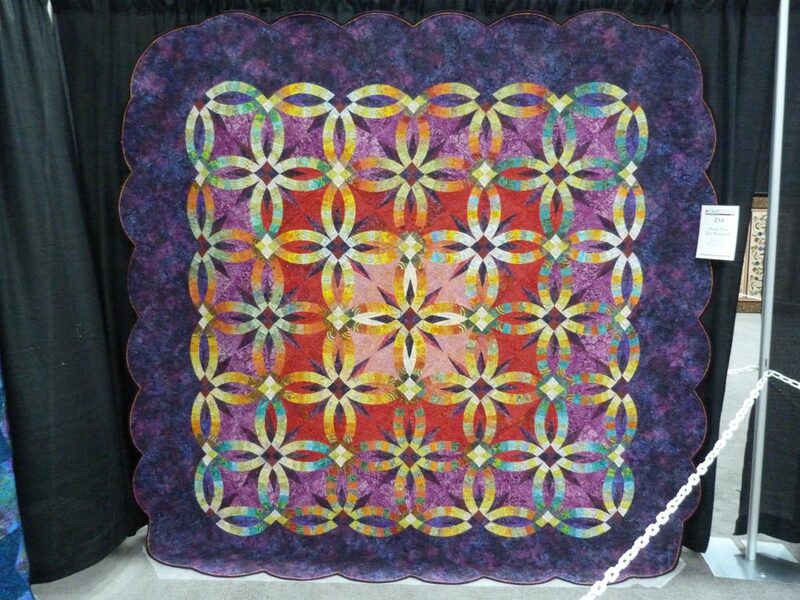 From a distance what strikes me is the color transition across the quilt and how the white ovals between the arcs of the Double Wedding Ring stand out. The arcs themselves, recede into the background, but the dark arc intersections are much more distinctive. Closer up, the subtle shades in the arcs are visible. From This Day Forward, 102″ x 102″, was made by Carol Duffy and Sara Velder of Plymouth, MA. Their design source was Wedding Star by Judy and Bradley Niemeyer. The use of gradual value changes in the arcs against the medallion-style arrangement of background colors is stunning. 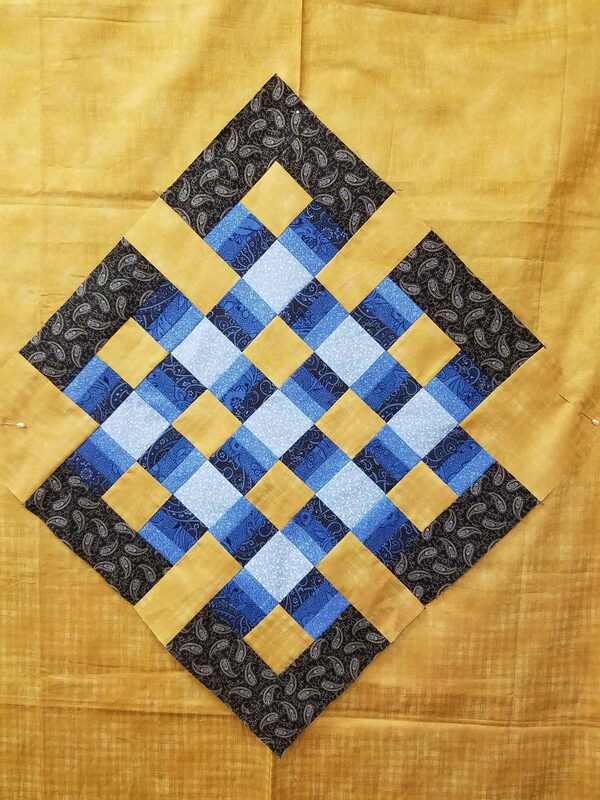 I love the addition of purple points in the large background pieces in the center of each block, giving a diagonal effect radiating out from the center of the quilt. The wide purple border is a great backdrop for the beautiful center field. One of the aspects that I love about quilting, is how even the simplest of quilting patterns may be presented in so many different ways just by changing the colors and the value placement. Do you set goals and resolutions for the coming year? 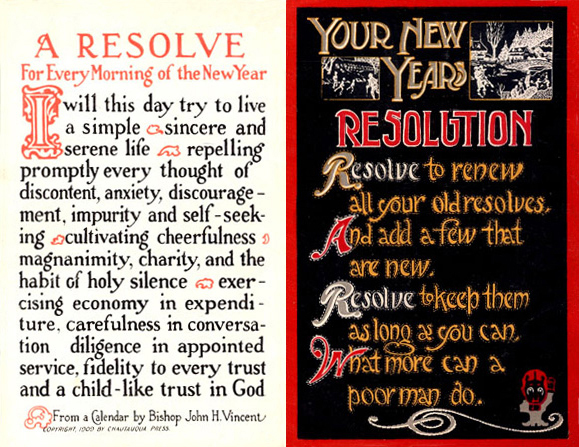 Here’s an early twentieth century postcard on the subject from a calendar by Bishop John H Vincent, published by Chatauqua Press. Many of us begin the year with good intentions for leading healthy and more active lives, but easily slip back into our old habits. Do you make plans for what you might like to accomplish in the coming year? How do you balance work and play? I have a notebook in which I write down my annual work and personal goals, such as, making specific quilts, designing a new workshop, improving current workshop materials, writing quilting patterns, raising $10,000 for the Mongolian Quilting Center, negotiating a certain number of teaching jobs for the following year, continuing to write one blog per week and produce one e-newletter per month, and so on. I try to be realistic so that I’m not setting myself up for disappointment. The next job is to divide these goals into doable chunks and make lists of tasks to achieve in the next two months. This may be broken down further into weekly or even daily goals, e.g. 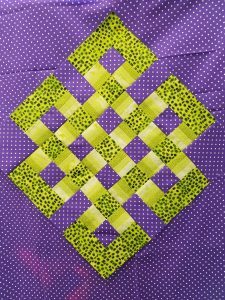 spend 5 hours per week quilting, complete editorial work on pattern, update business accounting records etc. I derive great satisfaction from checking items off my lists once they are completed. Towards the end of the two months, review what items aren’t checked off and think about why they didn’t get done. Write the goals for the next two months, (which may include uncompleted ones from the previous two months), and refer back to the annual goals to remind yourself of the bigger picture. It’s easy to get swamped by all the little tasks without making progress on the major goals. I lead a busy life, so I try to prioritize to make sure that the most important things are achieved and that necessary deadlines are met. This requires some discipline and determination to avoid distractions. Your priorities may change through the year and it’s OK to go back to the original goals and modify them. Some may not seem important any more, or new opportunities and goals may arise. Doing this helps me enormously, and I recommend it to you if you find this way of organizing and prioritizing your time useful. If you find that you have a lapse or simply that life gets in the way, don’t let that put you off for the rest of the year. You can start afresh in any month or on any day of the year. All the best, for a healthy and happy 2017!